MP helps positive singles avoid the embarrassment and possible rejection by telling a potential mate about their condition. Our members join because they want to find and date others who have experienced the same struggles. Our algorithm matches people who are living with the same condition(s), by distance and by their personal saved criteria. Registered members enjoy searching profiles of positive singles who also want to date, share their stories, and learn more about their conditions on discussion forums. Meet Positives understands what it’s like to have a secret. So why would we want you to download an app so that others might see it? We created our website to operate 100% on any type of device. No matter if you use an Android, iPhone, Tablet or Desktop, our platform is 100% auto-responsive to all devices you’re using. Sexually transmitted infections are some of the most hidden epidemics and in the US. According to the CDC, there are 20 million new viral infections every year. The most common STI/STDs in the US are Gonorrhea, Chlamydia, Hepatitis B, Genital Herpes, HIV, Syphilis, Trichomoniasis and Human Papillomavirus (HPV). The infections that occur each year cost about $16 billion in treatment. Approximately 50% of these infections involve people between the ages of 15-24. The main reason behind this percentage is because sexual activity is occurring the most in this age bracket. The above viruses infect almost 59.5 million people and about 50.5 million men are infected. This accounts for approximately 110 million people living with STDs in the US. These infections can be managed and those impacted can live a healthy life. If you are infected, you are not alone. The reason why Meet Positives exists is to ensure that you meet other interesting positive singles that understand your situation and are willing to spend their time with you. At Meet Positives, we are not only interested in helping you find love, but also making it last long-term. For this reason, we provide free advice and tips on how to build a strong relationship that will lead to happiness. We have created a community where you can share all of your concerns and information that you feel will help others. From this community, you will also get something in return. You will receive important details about how to handle your condition and how to live well with other positives. 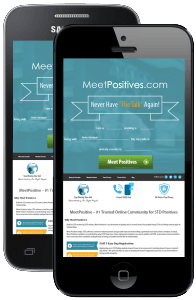 Unlike the methods used by conventional dating sites, Meet Positives uses a different approach to match men and women. We use different dimensions that are not only geared towards matching people with the same interests but also ensuring that the predictors generate long-lasting relationships. With our compatibility dimensions, you will find the perfect match within a short period of time.